Top Indian fashion and lifestyle blog: Essential tips for workout in summers. Essential tips for workout in summers. Workout in summers makes you sweatier and hence more dehydrated. It is hot and humid outside in India and people are having heat strokes. Mornings and evenings are still pleasant to go for a walk or jog outside. How are you planning your workouts in the summers? 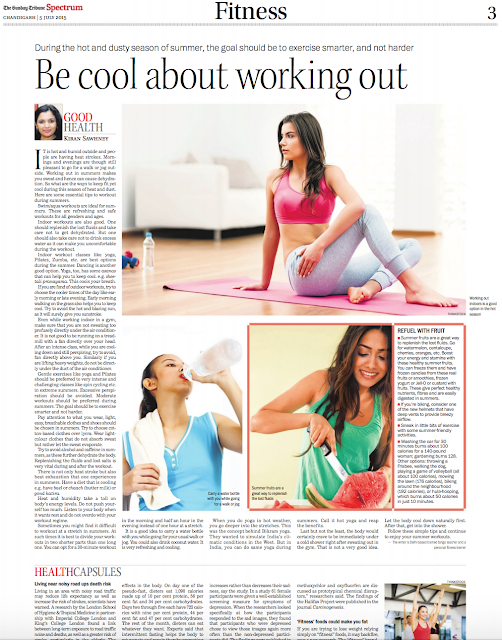 We thought we should give you some essential tips to workout during summers. Swim/ aqua workouts are ideal for summers. They are refreshing and safe workouts for all genders and ages. Indoor workouts are also good. One should replenish the lost fluids and take care not to get dehydrated. One should also not drink excess water that makes you uncomfortable during the workout. Indoor workout classes like yoga, Pilates, Zumba, etc. should be opted during the summers. Dancing is another good option. Yoga has some asanas that can help you to keep cool. E.g. sheetali pranayama. This cools your breath. If you are very fond of outdoor workouts, try to choose the cooler parts of the day like morning or evening. Early morning, walking on the grass, also helps you to keep cool. Try to avoid the hot and blazing sun, as it will surely give you sunstroke. Even while working indoor in a gym, make sure that you are not sweating too profusely directly under the air conditioner. It is not good to be running on a treadmill with a fan directly over your head. After an intense class, while you are cooling down and still perspiring, try to avoid, fan directly above you. Similarly if you are lifting heavy weights, do not be directly under the duct of the air conditioner. Gentle exercises like yoga and Pilates should be preferred to very intense and challenging classes like spin cycling etc. in extreme summers. Excessive perspiration should be avoided. Moderate workouts should be preferred during summers. The goal should be to exercise smarter and not harder. Pay attention to what you wear, light, easy, breathable clothes and shoes should be chosen in summers. Try to choose cotton-based clothes over Lycra. Wear light colored clothes that do not absorb sweat but rather let the sweat evaporate. Try to avoid alcohol and caffeine in summers, which further dehydrate the body. Replenishing the fluids and lost salts is very vital during and after the workout. There is not only heat stroke but also heat exhaustion that one experiences in summers. Have a diet that is cooling e.g. have bael or chaach (butter milk) or Gond katira. Heat and humidity take a toll on energy levels. Do not push yourself too much, Listen to your body when it wants rest and do not overdo your workouts. Sometimes you might find it difficult to workout at a stretch in summers. At such times it is best to divide your workouts in two shorter parts than one long one. You could do morning and evening half an hour each workout instead of one hour at one time. It is a good idea to carry a water bottle with you while going for your usual walk or jog. You could also buy coconut water on the way back. It is very refreshing and cooling. Summer fruits are great way to replenish the lost fluids. Go for watermelon, cantaloupe, cherries, oranges, etc. Boost your energy and stamina with these healthy summer fruits. You can freeze them and have frozen candies from these real fruits or smoothies, frozen yogurt or Jell-O or custard with fruits. They give perfect healthy nutrients, fibres and are easily digested in summers. If you're biking, consider one of the new helmets that have deep vents to provide breezy airflow. Sneak in little bits of exercise with some summer-friendly activities. For example: Washing the car for 30 minutes burns about 100 calories for a 140-pound woman; gardening burns 128. Other options: throwing a Frisbee, walking the dog, playing a game of volleyball (all about 100 calories), mowing the lawn (176 calories), biking around the neighborhood (192 calories), or hula-hooping, which burns about 50 calories in just 10 minutes. When you do Yoga in hot weather, you go deeper into the stretches. This was the concept behind Bikram Yoga. They wanted to simulate India’s climatic conditions in the West. But in India, you can do same Yoga during summers. Call it hot Yoga and reap the benefits. Last but not the least, the body would certainly crave to be immediately under cold shower right after sweating out in the gym. That is not a very good idea. Let the body cool down naturally first. After that, get into the shower. Follow these simple tips and continue to enjoy your summer workouts.